I made some more Valentine’s Day cards that came together quite easily and I really like. I picked up some individual sheets of paper from Scraps of Love that were just so cute for Valentine’s Day. The problem for me is that I like my cake and to eat it too. If I use the individual sheets of paper up, then I don’t have them anymore, and that makes me sad. What a dilemma! Just another first world problem that I have……………….poor me! I am working on some Valentine’s cards for, you guessed it, my valentines. Unlike my failure to bring Papertrey Ink stuff to Arizona, I seem to be well stocked with Valentine’s Day stamp sets. The challenge will be to use them all. First of all, I have had a cute little die from Sugar Pea Designs for a while and was itching to use it. It is tiny but impactful. I kept the rest of the card simple to make it stand out. Supplies: Papertrey Ink What the Doodle, Piece of Cake stamp set and dies, Chalkboard Love paperpad, Scor tape, Copic Markers, My Favorite Things rectangle die, Simon Says Stamp card base, Scotch foam tape. Today I am posting a card I made with the Poppy Stamps die called Urban Skyline. I started by making a night sky background with some Colorburst watercolors, and then decided it might work with the die. I added some lighter color to accent the buildings. The theme this week at Simon Says Stamp is Spread Your Wings and because the whole time I was making this card, I was saying “Bright lights, big city” in my head, I thought the card fit the theme quite well. Supplies: Poppy Stamps Urban Skyline die, Colorburst, Distress Watercolor cardstock, My Favorite Things Homespun Stitched Lines die, Peerless Watercolors, Simon Says Stamp dream die , Simon Says Stamp Woodgrain cardstock, Scotch 3M foam tape and Scor Tape,. Sometimes it pays to go outside your comfort zone. I was wandering around Creativation when a nice lady walked up to me and invited me to a Make and Take at the Tombow booth. “What are we makin and takin?” I ask. “Brush Lettering” she says. Well, if you lined up all things that I am not good at, brush lettering would be at the top of the list, so I declined. As I was walking by the table , the lady noted again that there was just one spot left………..for me. So I sat down, made the most horrendous attempt at brush lettering and proceeded to win the grand prize in the giveaway. Sometimes it just pays to humiliate oneself! I walked away with an Advanced Set of Brush Lettering Pens AND their brand new Planner book. Woo Hoo! I cannot post my Brush Lettering entry as I deliberately left it on the table. 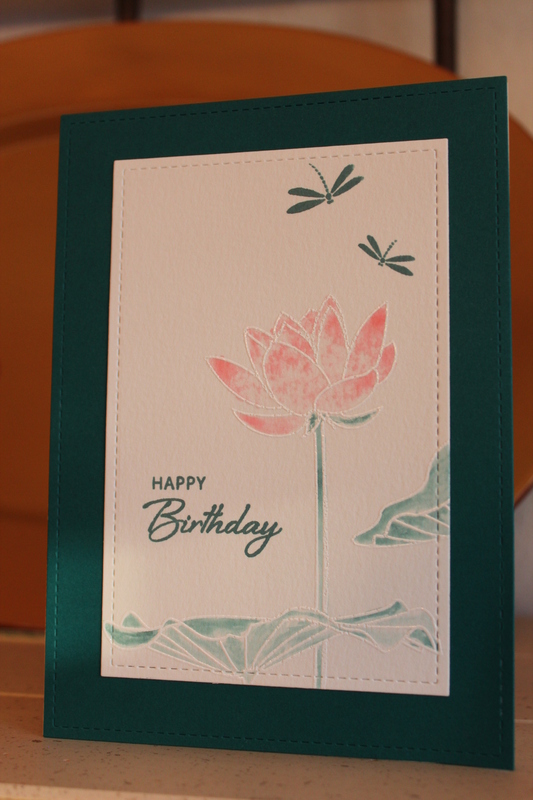 It truly would be total humiliation for me to post it, but I will post the cards I made in the Waffle Flower workshop. There are some great stamps coming out from Waffle Flower. The one I am most excited about is a layering stamp for making marbled backgrounds. 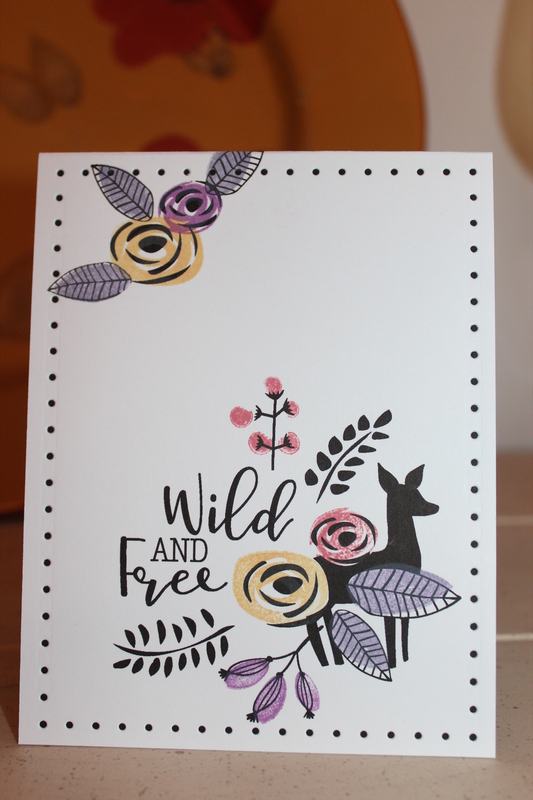 Included with the workshop was the stampset with the deer on it entitled Wild and Free. Well. yesterday was my first day at Creativation! I negotiated the Indianapolis 500 that is the I-10 freeway that leads to downtown without incident and only had to circle the convention centre about three times before finding a parking space. I was astounded to see the distances people traveled to attend this event. Had coffee with a lady from Panama. Sat between a lady from Columbia and a lady from Stockholm at the Lawn Fawn class. The Lawn Fawn class was fun. I was also surprised to find out how far flung the various employees of the companies can be. The Lawn Fawn pieces were stamped and coloured on the east coast, but cut out and kitted on the west coast. First Blog Post of the Year! Where does the time go? Seems like yesterday when I was digging out the Christmas decorations and now it is already the 6th of January and here I am, basking in the sunshine of Phoenix! I was having a bit of a creative slump yesterday. I was missing my stuff. When I fly down, I must be selective on what I take with me. No clothes…….all scrapbook stuff…………was a given……..but I still had to make some tough choices! My cousin referred to my decision dilemma as the real tough decisions of a first world person. Ouch that hurt………….and while he is right, I still defend my right to whine about it. Scrapbookers everywhere understand my stash separation anxiety! 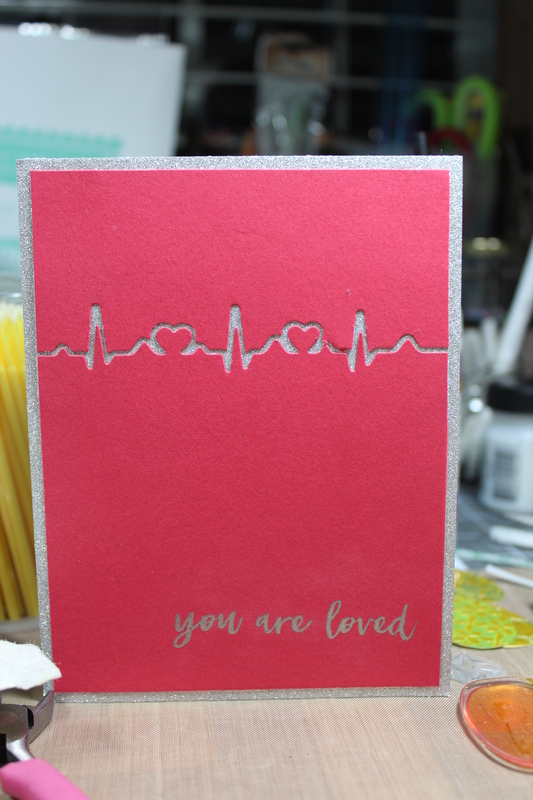 Anyway a trip to Scraps of Love and Joann’s and Hobby Lobby relieved the symptoms somewhat and today I was recovered enough to make a couple of cards. 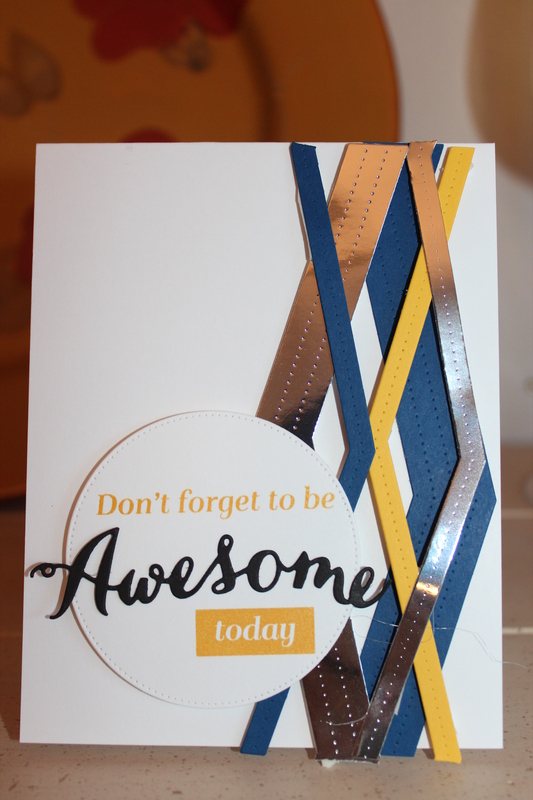 In actual fact, they were made with a stamp set that I brought with me and nothing I bought in yesterday’s shopping therapy got used in the making of these cards. Still shopping always makes me feel better. I used a stamp set from Stampin Up called Thoughtful Branches. 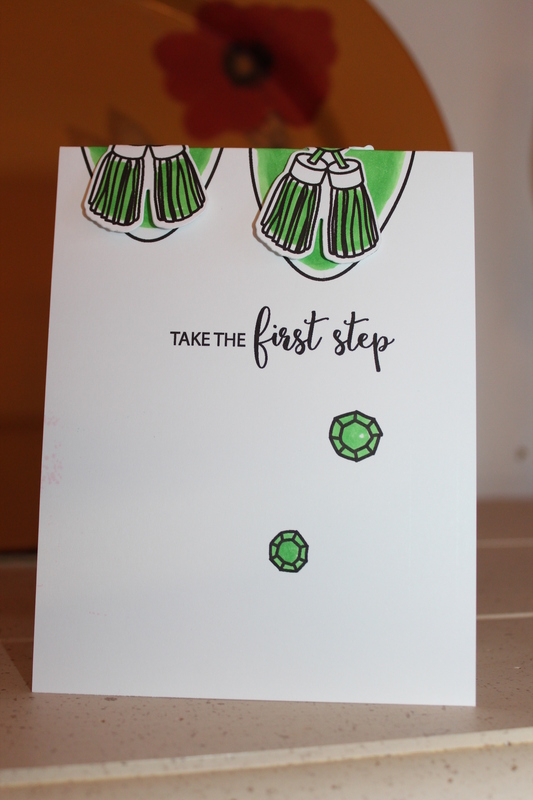 I had bought it a while ago on the advice of my Stampin Up Demonstrator and friend Jennifer. She was right, It is a very versatile stamp set, that I believe is no longer available. To show how versatile it really is, I used the same stamp in two very different ways. Once as a tree and once as a Hydrangea flower. Looks pretty cool I think.